The weather here in Chicago is starting to break. Although it seems like we keep getting little snow teasers just to drag on the winter (like the one forecast for tomorrow). Regardless, everyone is thawing out, so more posts are popping up on the Dad blogs about finally getting out of the house. We had a chance to get out and walk around the block a bit. 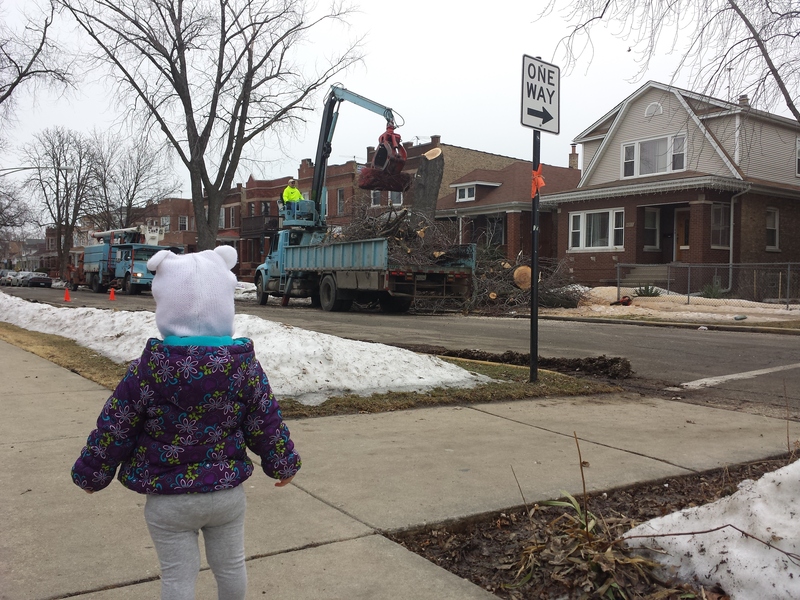 There has been a city crew cutting trees for about a week, so we went to investigate. Sweetie thinks that vehicles larger than the family wagon are cool. We just have to work on her enunciation. “Big truck” does not sound like that when she says it. We’ll keep working on that. So it’s no visit to the park. Or the zoo. Or a nature center. But it’s a start. Hope your thaw is going well, spring is coming! We have entered the stage where Sweetie declares her independence from clothing. Okay, really she just practices taking off various articles of her outfit. Sometimes she will try to put her socks back on, but really this time is more about taking items off. It all started with her shoes but quickly spread to include those oppressive socks too. And so for two weeks Sweetie has spent most of her afternoons running around the house barefoot. Now bare feet are cute and all, but not really worth writing about in an entry. Last night she stepped it up a notch though. Sweetie decided after her bath that 1.) She did not need to be carried to her room – she could walk; and 2.) Towels stifle her being. With that she cast off her covers and ran free through the house. 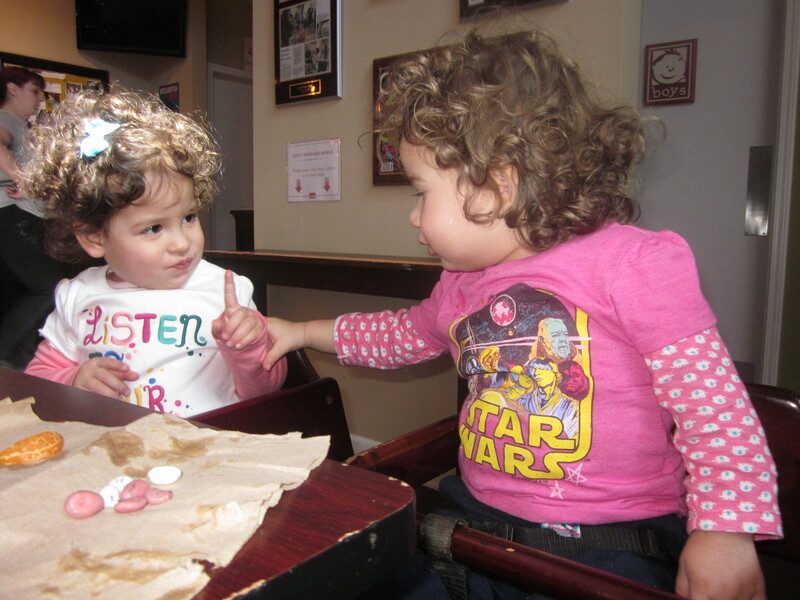 Reaching new milestones has been much of the fun of raising our infant into her toddler years. During this time the milestones are exciting and cute. That must be why you see them written about in so many parent blogs; first time eating solid food, first steps, first time using the “potty”. Yeah it’s cute now, probably to buffer the teenage year milestones; first time saying “I hate you Dad,” first time sneaking out, first time crashing the car. So our latest milestone is all about Sweetie’s vantage point; how she sees the world. 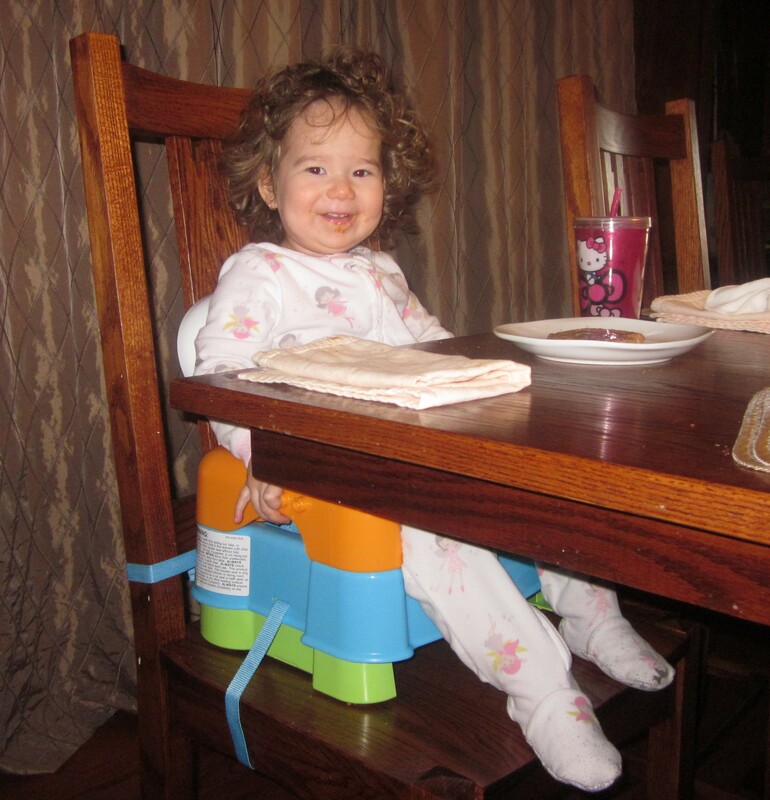 She has graduated from her high chair to a booster chair. And in the car we turned her child seat to face forward. Okay, at face value, these are no big deal. Admittedly, there is a small voice in my head threatening to slap me for making a post about these things. But for us parents that is the beauty of milestones – there is so much more to it. Changing Sweetie to a booster seat has brought her down to our level at the dinner table. This presents many new experiences for both her and us. Obviously, she feels a whole new level of inclusion and she likes being closer to Wife and I. From this seat she can choose to eat Wife’s food over her own (even though we all eat the same dinner). On our part, we are learning all of the ways that a toddler can move food and tableware around the table. Despite the challenges of keeping everything on top of the table, it is nice to have her closer. It’s not only easier to feed her it’s nice to have her right with us. Turning Sweetie around in the car has been a new source of humor and inspiration. The first day we tried it we had to drive down our snowy and pot-holed streets. Quietly from the back I heard “wheee” and knew that she approved. That was pretty great, but I’ve found that logistically this is better for checking on her. Most importantly, with her facing forward it is easier to make eye contact with her. So when a jam comes on, we can rock out together. This is going to resurface continually as Sweetie’s vantage point shifts throughout her life. And here lies the lesson. Sweetie is going to have to learn that the way she sees life may seem good, right, fun at the time, but that can, and will, change. And just because her seat might work well this year, that will change as she grows up. So here is the balance that Wife and me to figure out. We get to learn how to validate Sweetie’s viewpoint while also letting her know it’s limited and transient. I am fairly certain I was not receptive to my own parents’ advice on this, so I’m sure it will go well with my daughter. Oh boy, I can almost hear it now. Wheee! Last week we found ourselves once again home bound by frigid temperatures and winter weather. I am sure many of you dealt with the same conditions. This post came from my last-minute decision to buck the current attitude in Chicago. I caught myself trying to jump on the anti-winter bandwagon with the majority of the city (and country?) and lament the things that we have not been able to do because of the persistent cold. But I stopped in time and decided instead to celebrate a couple of the things that we have done during this snowy and cold winter. Truth be told, I enjoy the winter. I was born in December, so of course I am biased. I have long been a fan of sledding and used to snowboard as well. And I am one of those people who do not mind shoveling snow, particularly on a quiet evening. I learned years ago in a Denver blizzard that good gear, i.e. boots, coat and gloves, makes a world of difference. So I am prepared for cold, snowy weather and enjoy it. Now dealing with a toddler during the winter has been another story. But this year has been a great introduction to all things winter. Sweetie thinks snow is very funny stuff. She does not quiet get what it is, but smashes it around anyway. She too has all of her gear so she can go out to play. (Well, if she could move in the gear she could play – we have had Christmas Story flashbacks all winter!) We found some toddler sleds, so one day Sweetie and Wife and I met up with Big Daddy B, Momma Z and Linda for some sledding. 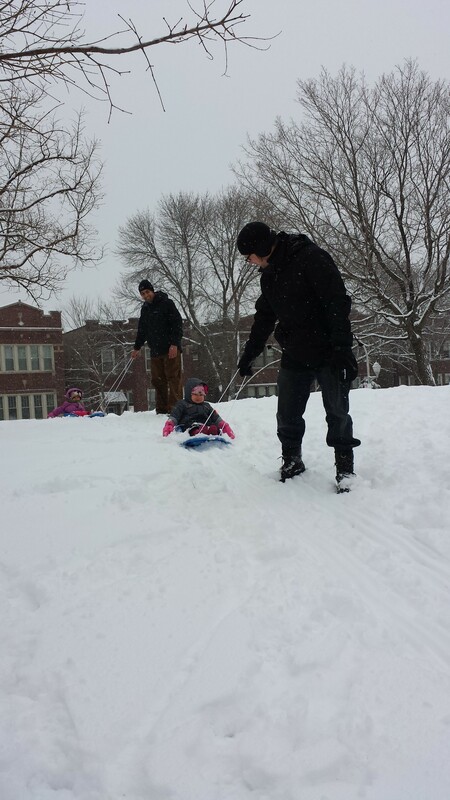 As you can see, the dads were definitely the power-sources for the sledding. The new snow was so thick that downhill wasn’t so great, but the sleds went along the flats just fine. So we all enjoyed an afternoon at the park. Of course this was different from summer time at the park, but it was still a fun time spent with friends. 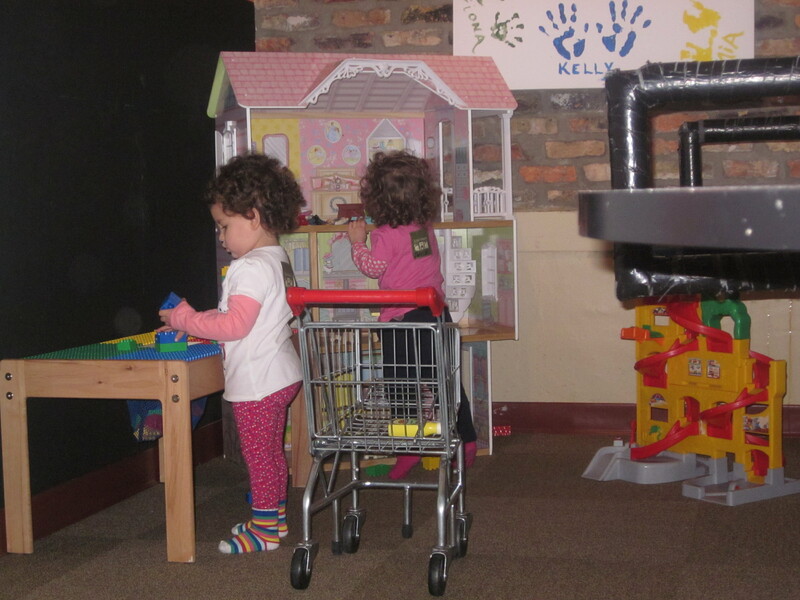 We have taken Sweetie and Linda to some indoor play areas as well. Momma Z and I figured that as long as we can get them in and out of the car safely, then it’s a go! This is the Little Beans Cafe in Chicago. 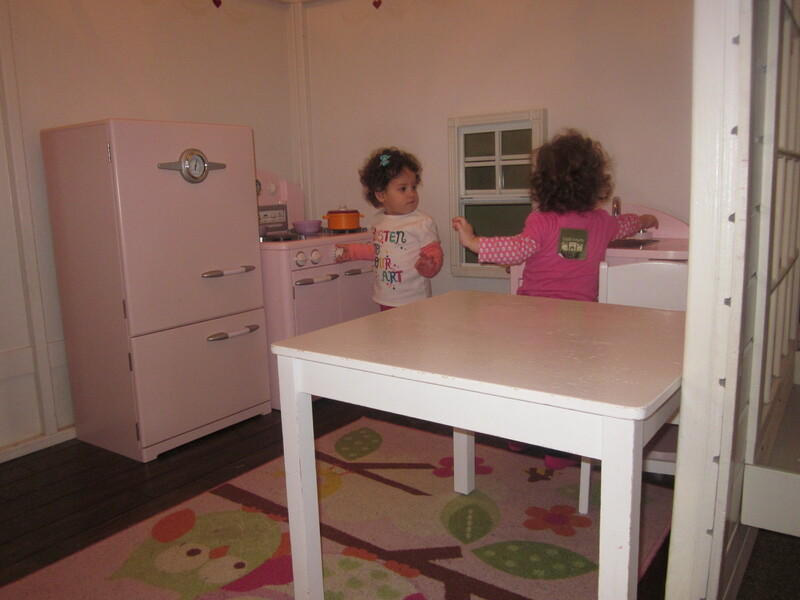 It’s an open layout, loft-style play space with five “playhouses” and all sorts of pushing/riding toys. The girls ran around for hours. If you have a place like this near you, check it out. It is a must when playing outside is not an option. Another great thing about staying inside for days on end is the cooking (and/or baking )! We have said “Bah!” to plain chicken breast dinners and rice side dishes. I have been tearing through Wife’s cookbook collection trying all sorts of seasonal dishes. Hey, it helps break up the monotony! And don’t forget the sweets! 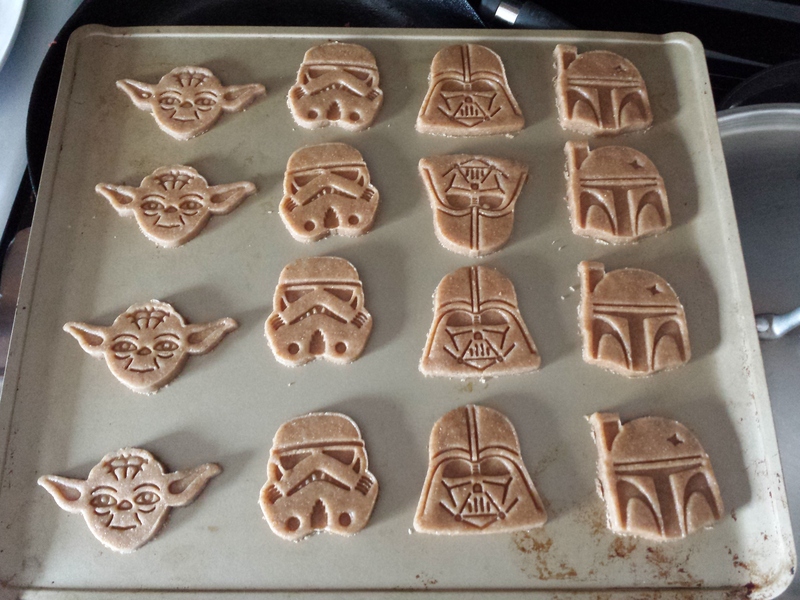 Yes, those are Star Wars cookies. There is a funny story about those cookies that you can expect to read later. In all honesty, Momma Z bakes circles around us and has taken full advantage to her time inside. Thankfully, she likes to share and is quick to offer freshly baked cookies and cakes with her play date invitations! All in all, it has seemed like a Chicago winter to me. I keep telling people, “This is how I remember Chicago winters.” I heard a great report on NPR where they interviewed a woman living and working in California. Her response to all of the winter animosity was simple, she said, “If people aren’t happy living in the cold and snow, tell ‘em to move here.” I agree with her philosophy. Chicago has always had strong winters with cold and snow and wind. I say prepare for it, dress for it and enjoy it. And if you don’t like it…move to California. 1 degree out, can you believe it?